Castlebar - County Mayo - Lecture on Gold Hoard found in Co. Roscommon. Lecture on Gold Hoard found in Co. Roscommon. Lecture on the Coggalbeg Gold Hoard. The lecture "Safe Secrets - An Early Bronze Age Detective Story from Strokestown" - takes place at Turlough Park, on Tuesday, November 8th at 3 pm. Booking advisable. The hoard made news headlines two years ago when a safe containing the objects was stolen from a premises in Strokestown Co. Roscommon, and following intensive Garda investigations was ultimately found in a rubbish skip in Dublin. 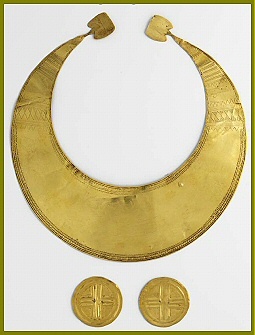 The hoard which consists of a gold lunula (a crescent-shaped collar), and two small gold discs dating to the Early Bronze Age c. 2300-1800 BC., is now in the safe keeping of the National Museum and it is an important addition to its large collection. The Coggalbeg Bronze Age Hoard on temporary display at the Museum of Country Life. Launch of new historical book. Mayo Historical & Archaeological Society. Eagles in Mayo: their heritage and history. Prof. Tadhg O'Keeffe to address historical society meeting. An interesting historical & cultural event..
Pilgrimage Islands on the West Coast of Ireland. 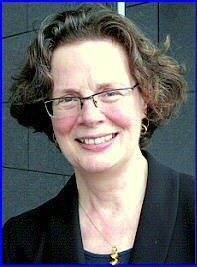 Mayo Historical & Archaeological Society - Library Lecture. Prof. Gearoid O Tuathaigh to address Mayo Historical Society meeting in Castlebar. Michael Gibbons to lecture Mayo Historical & Archaeological Society. Author Tim Pat Coogan to speak in Castlebar. Mayo Historical & Archaeological Society - Lecture Reminder. Mayo Historical & Archaeological Society -Floral presentation. Sinead McCoole to lecture Westport Civic Trust. Monastic Ireland - A Gift From The Nile! Field -trip to Louisburgh area. New book on Inishkea Islands and Francoise Henry available. Achill Archaeological Field School - Public Lectures.